AUGUSTA, GA. – The GRU College of Education’s Department of Kinesiology & Health Science will host a lunch-and-learn on safe commuting by bicycle in the CSRA on Nov. 12. A certified instructor from the League of American Bicyclists will present “Confident City Cycling in Metro Augusta” from noon to 1 p.m. in Christenberry Fieldhouse. The presentation is free of charge and open to all GRU students, faculty, staff and friends, in partnership with Wheel Movement of the CSRA. It will provide a basic introduction to anyone interested in getting healthier, greener, and enjoying their commute, including information on how to safely navigate an urban environment on a bicycle. 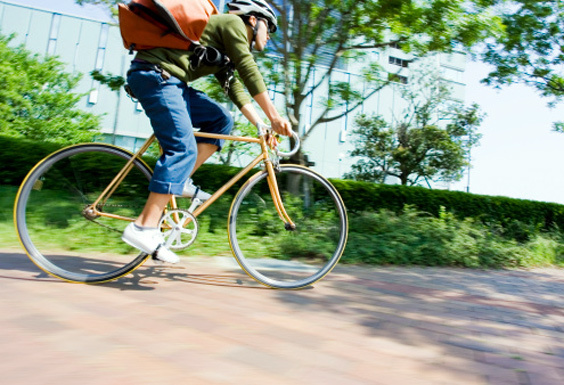 “The opportunity to bicycle commute in Augusta is a reality for many residents,” said Dr. Chris Mojock, Professor of Kinesiology, in the College of Education. Mojock currently commutes to his office at Christenberry Fieldhouse from his home in Evans. He cited the Canal trail from Evans and the Greeneway from North Augusta as two examples of bikeable commutes into the downtown corridor. However, Mojock’s commute takes advantage of bike paths/lanes and wide, four-lane roads like Evans to Locks, Fury’s Ferry and Davis to reach his office. And the benefits of biking can far outweigh any inconveniences. The American Auto Association (AAA) estimates that the annual cost of car ownership hovers at around $9,000. But the Sierra Club reports that bicycle commuting can cost as little as $300 a year. “From a professional standpoint, improvements in health through exercise and increased physical activity have been shown to improve workplace productivity. It also provides much needed stress relief on our way to and from work,” Mojock said. Mojock said the equipment to get started is minimal: A bicycle, helmet, tail light, headlight, and a bag to carry possessions. For more information about Confident City Cycling in Metro Augusta, contact Dr. Chris Mojock at 706-731-7923 or cmojock@gru.edu.